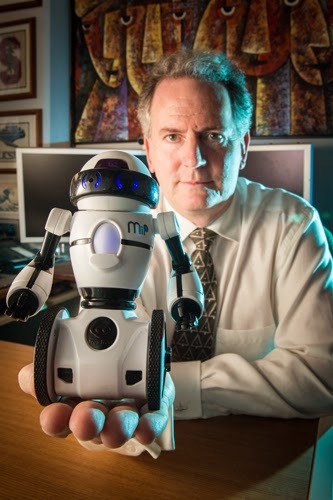 LA-area UC San Diego alumni will get an exclusive look at MiP, the toy robot designed by toymaker WowWee and the UCSD Coordinate Robotics lab during an Inspiring Minds event May 13 at the Luxe Sunset Boulevard Hotel. Tom Bewley, a professor in the Department of Mechanical and Aerospace Engineering, who heads the coordinated robotics lab, will be the featured speaker. What are the simplest robotic designs for overcoming various obstacles? How can advanced algorithms for coordinating robotic sensor vehicles help us better respond to environmental hazards? Where did the radiation from Fukushima, the oil from Deepwater Horizon, and the ash from Eyjafjallajökull go? Where will a category 5 hurricane developing over the Gulf of Mexico make landfall? Robotic sensor vehicles, advanced control algorithms, and high-performance computing will help us to quickly and accurately answer such questions in the future; recent major advancements of such coordination algorithms will also be discussed. How do you inspire K-12 students to take an interest in STEM? Make it fun! Attendees will also have a chance to meet MiP, the first of an engaging new line of consumer toys and educational curricula, developed in collaboration with WowWee Robotics, designed to do exactly that. More info on MiP here and here.